Banky W and Adesua's wedding took place today, November 19, 2017, and celebrities turned up for the event. 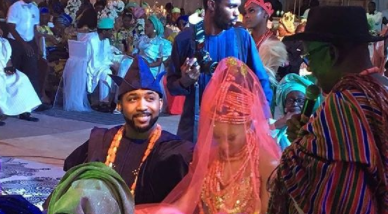 Lagos witnessed the real 'Wedding Party' today, November 19th as Nigerian entertainment's hottest couple, Bankole Wellington aka Banky W and Adesua Etomi tied the knot traditionally. Everybody who's anybody turned up for what has been considered the celebrity wedding of the year. From veteran actress, Sola Sobowale to Rita Dominic, Nigerian music heavyweight 2Face Idibia plus wife to TV personality, Stephanie Coker and director, Kemi Adetiba, #BAAD2017 felt pretty much like an entertainment award show. Check out some of the famous faces who graced the event.